As some companies try to increase the quality and functionality of high-definition touchscreens for miniaturized, mobile applications, others are moving in the opposite direction — blowing up the size of multi-touch displays to create a completely new way to experience the advanced technology. MyMultitouch, a German company focused on multi-touch solutions, showed off its state-of-the-art 84-inch multi-touch display at this year’s CeBIT in Hanover, Germany. The monster of a display is a definitive change of pace from the usual smartphone and tablet touchscreens. Rightfully named the Alvaro GIANT, the 3,840 x 2,160 Ultra-High Definition display outputs at 4K resolution as it sits atop an equally large metal structure that allows the screen to rotate from upright to a completely flat position. The display accepts any HDMI, DVI, AV, RGB, USB, or DisplayPort input, and even offers an integrated Windows 8 system for standalone use. With only a 12mS touch response time, the LED Cell imaging technology used for the touch display allows up to 32 simultaneous touch points and can even differentiate between different hand positions making contact with the screen’s surface. The bezel contains an array of LEDs used to detect light breaks at the surface level. A fairly old touch detection method, often used in an industrial environment. It is nice to see the same tech can handle 32 simultaneous inputs. Unlike most other touch displays of this kind, the Alvaro GIANT has something others lack: a price tag. The 84-inch screen will retail for $43,000 US and is mainly targeted for public display applications, such as retail or museum exhibits, as well as other educational and industrial uses. Designed for continuous, 24-hour operation, toughened safety glass and a rigid metal case ensure the GIANT’s reliability in public settings. Pricey? You bet! 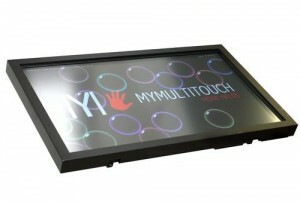 But, that’s to be expected from a mammoth of a display capable of multitouch. The Alvaro GIANT will run off of any Windows OS as far back as XP, as well as Mac OSX, Linux, and Android. So, yes — if you happen to have that much extra cash lying around, you can indeed play Angry Birds on the 84-inch screen. Check out the video below of the folks over at SlashGear giving the Alvaro GIANT a test-run at CeBIT.